조선 전기의 조선과 중국을 중심으로 동아시아 지역을 그린 세계지도이다. 바다의 물결무늬[수파묘(水波描)], 중국의 연호와 지명 등을 볼 때 16세기 중엽에 제작된 것으로 추정된다. 지도의 전체적인 윤곽은 1402년에 만들어진『혼일강리역대국도지도(混一疆理歷代國都之圖)』와 유사하지만, 조선 부분은 보다 자세하고 정확하게 그려졌다. 반면, 일본은 지도가 생략된 채 조선 남쪽에 위치만 표시되었다. 이처럼 중국과 조선만 자세히 그리고 그 외의 지역은 위치만 간략히 표시한 방식은 중국 중심의 세계관이 반영된 결과로 생각된다. 본 지도에서는 조선의 팔도와 중국의 각 성(省)은 지명의 색채를 달리하여 구분했는데, 다만 함경도 지역은 박락이 심하여 군현명을 알아보기 어렵다. 산동반도 남쪽의 황해 부분에는 변동이 많았던 황하(黃河)의 유로 변천의 역사가 기록되어 있다. 임진왜란 이전에 제작된 지도로서 현전하는 것이 매우 적은 상황에서 본 지도는 16세기 동아시아의 지리적인 내용 및 당시 조선지도의 실상을 보여주는, 자료적 가치가 매우 높은 지도로 평가된다. This map depicts China and Korea, with Japan merely indicated by its location. It resembles Honil gangni yeokdae gukdo jido (Integrated Map of Historical Capitals), but with greater focus on China and deleting Arabia. The map reflects the China-oriented global perspective, which emerged among Koreans in the 16th century. With the seas rendered in wave form, the map has similar contours of the Asian continent to the Integrated Map of Historical Capitals produced in 1402, with Korea depicted more precisely and in greater detail. Regrettably, however, the section for the Hamgyeong-do Region has been severely abraded with the county names obliterated and Baekdusan Mountain also blurred. Korean provinces and counties are marked in different base colors from those of China. Toward the bottom, in the Yellow Sea south of the Shandong Peninsula, is found a record on the changing courses of the Yellow River through history. The map was made before the Japanese Invasions of 1592-1598. 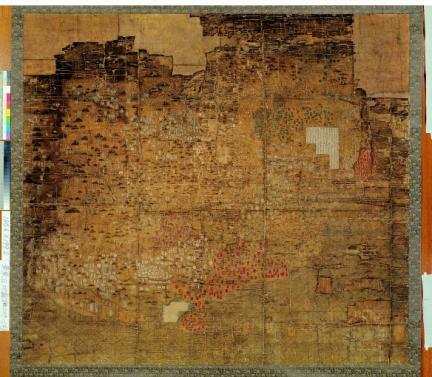 It is rare and valuable cartographic material from the early Joseon Dynasty, which offers a glimpse of the 16th-century world view of Koreans.